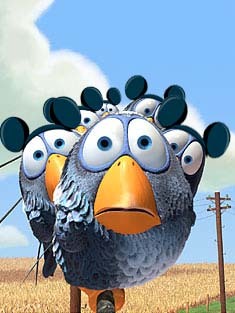 After a lot of rumours it is now official that Disney acquires Pixar for $7.4 billion. I think this is a great deal for both companies. I was disappointed a few years ago when Michael Eisner let go of Disney’s contract with Pixar, but now it looks like Disney will continue to distribute Pixar’s films as it has for the last 12 years. I am a big fan of both Disney and Pixar animated films, but I haven’t been so impressed with Disney’s most recent outputs; although I thought Chicken Little was pretty great, it was no Finding Nemo. Pixar’s next release is Cars, coming out in June this year. I haven’t been very impressed by the teaser, and the whole idea of talking cars … well, talking car just don’t seem as cute to me as talking clown fish. Could it be that Apple/Steve Jobs quickly sold Pixar for $7.4 billion knowing that Cars could very well be Pixar’s first bust? I’m comforted in the thought that John Lasseter, director of Toy Story, A Bug’s Life and Toy Story 2, is also directing Cars … so it must be good. We’ll know for sure in June. What’s next for Pixar after Cars? The company is very secretive about its upcoming releases, but according to numerous movie information sites, the next movie to come out in 2007 is titled “Ratatouille” and will be about a rat living in a fancy restaurant in Paris. With Disney now fixed to be releasing that and upcoming Pixar films, rest assured that we’ll be able to buy stuffed rats at Disney Stores in 2007. This entry was posted on Wednesday, January 25th, 2006 at 1:11 pm CET and is filed under Disney, Leiden, Movies, News, Pop culture	with tags . You can follow any responses to this entry through the RSS 2.0 feed. You can leave a response, or trackback from your own site.